house wren studio: spring sponsors and a giveaway! What a wonderful give a way. Please enter my name. I would love to be one of the lucky ones! Thanks for this opportunity! You are making me wish I could make the trip to Vermont. Everything sounds and looks lovely! What lovely goodies. So sweet to offer them up in a giveaway. Some day I will make it to Vermont! Going to check out all the sites & shops including yours. Hugs. What a great give away! Please include me in the contest. Thank you! One of these days perhaps I will make it to one of your retreats. it always looks so lovely! Thanks for the giveaway. this is wonderful. Thanks so much for the chance to win these! Oh I so need a getaway! I won't have one, but I really need one! Yours always look amazing and good for the soul. What an awesome assortment of treats - count me in! I hope to join you in Vermont at one of these delightful weekends. Lovely goodies from your generous sponsors. I'd love to be the reciprient of this giveaway. I so wanted to attend but of course was unable to this year. I will get there in the future. Would love to receive these loverly things. Thank you all for your generosity! Charlotte, your Vermont getaway is the trip of a lifetime. I feel so blessed to have been there and made such wonderful friends. I'm counting the days to come again. Love to you, Meleen, Tammy and the girls & Kana. Till we meet again! I would love to attend sometime! Such beauty here! Oh my! Wishing I had been there in person of course but winning this might ease the pain a bit! These artists are so generous with their time and talent. I'm enjoying reading about the events and lusting after everything! Can't wait until I actually can come. I have been in Vermont in the fall and can only imagine how beautiful it must be as the world awakens from a winter nap. One day I hope to travel across the country and have a play weekend in Vermont. Thanks for always inspiring. Now to go look at some new rolling pins! Gorgeous! What beautiful items! Sign me up for the drawing, PLEASE! These are all beautiful items from inspiring people. What a lovely giveaway! You always have such lovely collections of goodies! Thanks to you and your gracious sponsors for the wonderful giveaways! 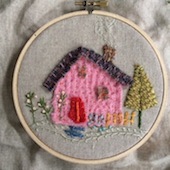 Such beautiful handmades-makes me wish I stitched faster than I do. I want to make All the things! Thank you for the lovely giveaway, too! What wonderful friends your sponsors must be to be so generous.Thank you. Your getaway week-ends sound fabulous. When I finish chemo treatment I would love to be rewarded with one of your week-ends. Would love to be with Rebecca Sower in class sometime. I love taking classes from Kaari. Maybe I can make that one. Thank you so much for your inspiration. I hope to come to one of your retreats one day as they sound wonderful. I was fortunate to have met Rebecca Sower at the very first CKU in Provo, Utah in 2001. I was in her 'Storytime' class. I also love her book, "Scrapbooking Life's Little Moments" and her blog. All of your artists are so very talented and generous to share with us! Oh how I wish I could go to one of your Vermont getaways, I bet they are so much fun. This is a great giveaway thanks! Wow! Thanks for the chance to win this amazing giveaway. What a lovely assortment of goodies. This looks like it was a good time! I wish I could've went! Your get away looks like a fun time, too bad Illinois is so far from Vermont. Please put my name in your drawing. Thanks! What lovely items! I would so enjoy and treasure these. oh wow what a great give away. Love M.E. and so much other stuff on here! Just lovely! I LOVE ALL OF THE ARTISTS FEATURED! Would love to be lucky for once & win! I just want to be clear--- if you go to http://housewrenstudio.typepad.com/…/spring-sponsors-and-sh…, you can register to win a swag bag with this mug and SO many other wonderful things in it! Love ME, she is such a fun artist! I love the swag bag!!! Please enter my name to win!! !